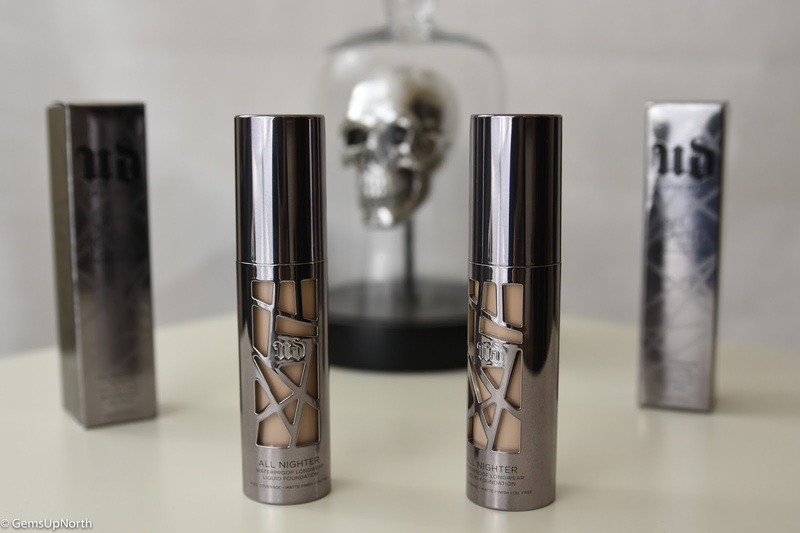 Gem's Up North : Urban Decay All Nighter Liquid Foundation Review - Makeup that stays up! 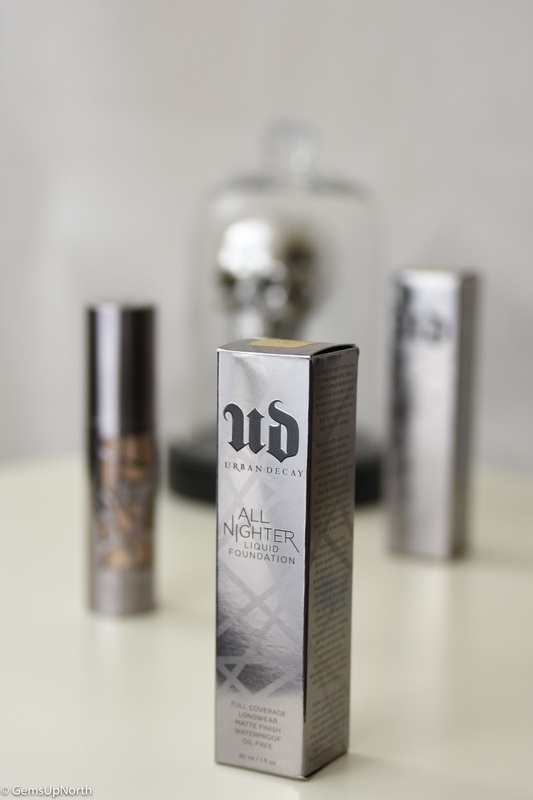 Urban Decay All Nighter Liquid Foundation Review - Makeup that stays up! 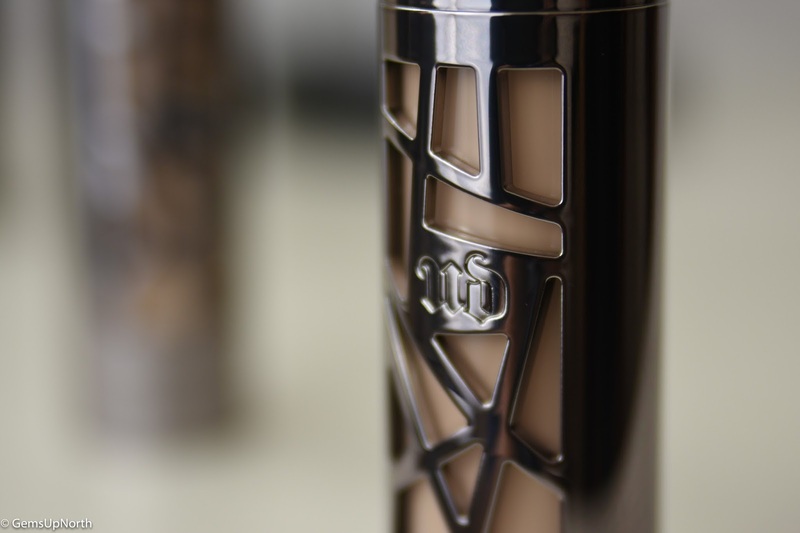 This is one of the Urban Decay product launches I've been most excited about this month. I do currently use the Naked Skin foundation from UD but sometimes it takes a lot of work to get it right on my combination prone skin, which on rushed mornings or lazy days isn't what I want. I'd been told that this new All Nighter Foundation would suit my skin more and with my face being a combination including oily in areas I was super excited to try this foundation. Urban Decay kindly sent me a couple of shades of the All Nighter Liquid Foundation to try including shade 1.0 which is the shade I use in the Naked Skin and shade 1.5; I gained more information about the shade numbers when I visited my local counter. I was told by the MUA on the counter that the .0 shades are for yellow and golden warm skin tones, .5 shades work best on cool and pink skin tones and .25/.75 shades are for neutral skin tones. The collection has 24 shades so theres a shade match for everyone; my shade match was shade number 1.5 a shade darker than my Naked Skin however from the information above I do think this shade would be best for my skin tone having pinky tones in my skin. First of all, look at this gorgeous packaging!!! The bottle is still very lightweight like the Naked Skin but with a fabulous new design, the metallized gunmetal effect looks fierce and strong with the asymmetric cutouts on the front of the bottle giving it an edge which is exactly what I'd expect from UD. They have also fitted these new bottles with an airless pump meaning we can get every last bit of product out from the bottle which gives this foundation more value for money. The new All Nighter foundation is waterproof, absorbs oil and provides a complete overall coverage that will last all night, I personally like that the foundation has a fully matte finish giving me a flawless look all day and night long. The product formula includes light-diffusing pigments which help to blur flaws giving you perfect looking skin. On my first day wearing this foundation I got quite a few commitments saying my skin looked fresh and flawless, this gave me a little confidence boost that day. I applied the foundation using a buffering brush and dabbing in any excess with a blending sponge which was effortless; I of course used my usual primer before adding this foundation on top. Whilst on the counter the MUA used some of UD's new Pro Brushes which work fabulously when applying this new foundation, I think I'll be making a payday purchase at the end of the month. By the end of the day my makeup was still in place and looking great, I was surprised at how fresh my face still looked after a long and hot day. I really can't fault this foundation for long-lasting wear and comfortability, the product is so lightweight on the skin, I felt that it was lighter than the Naked Skin which is already so lightweight. My favourite elements are the matte finish, long-lasting flawless look and bottle design but I was super impressed with how the foundation sat on the oily areas on my face. All Nighter applied easily over my oily areas and I found that any excess oil was less noticeable when wearing this foundation, I didn't feel or look shinny or sticky throughout the day either which I have found with other foundations. Since receiving this foundation I have worn it a lot more than my Naked Skin foundation and with awesome results; foundation isn't something I usually wear every single day but I can't stop wearing this All Nighter Foundation! 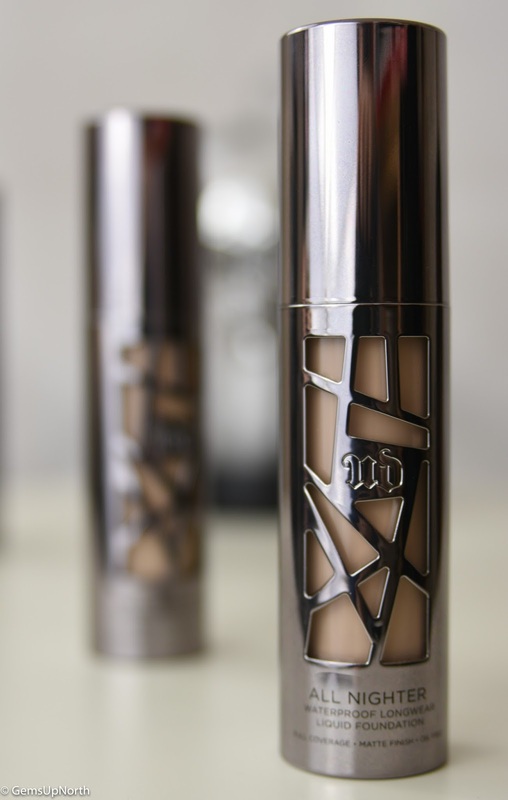 The All Nighter Liquid Foundation is available now on the Urban Decay website and at Urban Decay counters priced at £27.00. *PR Sample - All comments are my own, see my disclaimer for more information.